The Mashimizu is the answer for Pure Water. Everything that we know about what it takes to make Pure Water for a pond is included in the Mashimizu package. 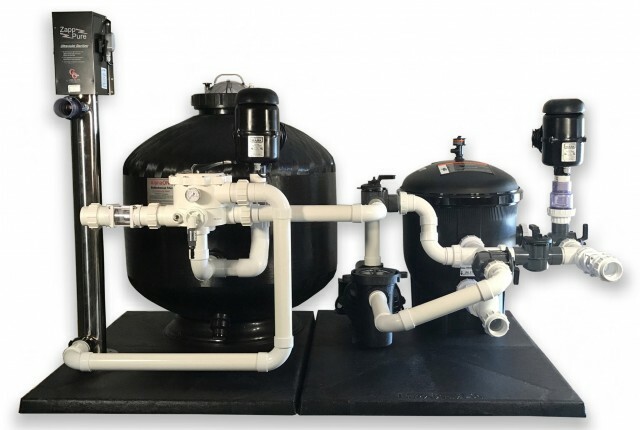 For good water in a pond you need Prefiltration that comes before the pump so debris is separated prior to the pump and is not "pureed" into a high organic froth. This is provided by the Vortek SS Delux. Water enters the Vortek SS Delux first as it comes from the pond. Due to the out standing success with the Vortek SS Delux it is now standard equipment on our flag ship system. In the past the regular Vortek SS was what came on the Mashimizu system but starting in 2011 all Mashimizu systems come with the Vortek SS Delux. Next the water flows to one of the Artesian2 energy efficient pumps. These pumps flow alot of water and use a minimal amount of electricity. These pumps can save you several hundred dollars a year in electrical costs. Water then flows to the heart of the system, the AquaBead or the AlphaONE filter, which acts as a Biological and Mechanical filter. Here in the AquaBead/AlphaONE filter beneficial bacteria lives to perform the Biological portion of its job. As the Bacteria coats each individual bead within the filter the Mechanical part of its job is performed as the beads become sticky with biofilm. As the water passes through the filter these "sticky" beads grab even the smallest of debris particles. Lastly on its journey through the Mashimizu system the water is exposed to the powerful Zapp Pure Ultraviolet light where algae, bacteria and virus are terminated. All of the above components are carefully hand assembled and plumbed on an all weather black pad. Hand tightened unions are used to assembled the plumbing and then each piece is removed, labeled and carefully packaged for shipment. Upon delivery the system is then easily moved into place and reassembled in less than an hour by simply hand tightening the unions back together. All of the components together equal a lot of weight, but with each one packaged separately the heaviest part of the system is an empty filter shell. This allows one person to set the system in place without the need of friends or neighbors. Upgrade any of the Mashimizu Systems to include one of the LH version filters or add a MultiCyclone 50 prefilter to the system. We can also add one of the ThermaKoi heaters and it all comes preplumbed and ready to go. It doesn't get easier than that. The price for the Mashimizu? Probably less than you were thinking for such an outstanding "Waste Treatment System".